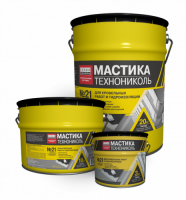 Adhesive mastic #22 is used for adhesion of roll-fed bitumen, polymer-bitumen roofing and waterproofing materials (without film) to concrete, metal, sandy-cement and other surfaces. Mastic is a multicomponent material consisting of bitumen, modified by polymer, fillers, solvent and technological additives. This fire-free installation method allows for combining the advantages of roofs made of roll-fed materials and seamless solid mastic roofs. The waterproofing material when installed on mastic cannot be “burnt through”. The use of mastic also provides for the ability to install materials on combustible types of bases. Adhesive mastic #22 is distributed on the base by a toothed putty knife or special comb. Mastic surface coverage : 0.8–1.8 kg per 1 m.